​Would you like to sponsor this event? £100 includes a 10 minutes speaking slot, exhibitors stand, 1 ticket and business literature on every place setting and online marketing prior and after the event across our social media and digital marketing too. 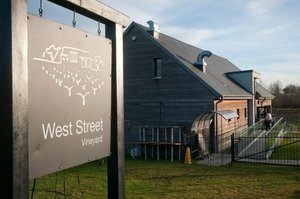 Golden Ticket price £75. 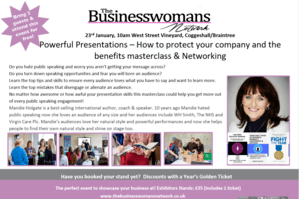 23rd Jan - Presentation Skills - How to get every audience loving you and wanting more! Do you feel like you never get your message across? Do you turn down speaking opportunities? Do you feel like your boring the audience? Even the most polished presenter needs to up their game and learn new skills - this is not to be missed! Learn the top tips and skills to ensure every audience loves what you have to say and want to learn more. Learn the top mistakes that turns an audience off. Learn how you alienate your audience and how to win them over. An interactive masterclass focused on increasing your sales, confidence and success. Always business focused. Always fun. Always proactive and aimed at your needs. 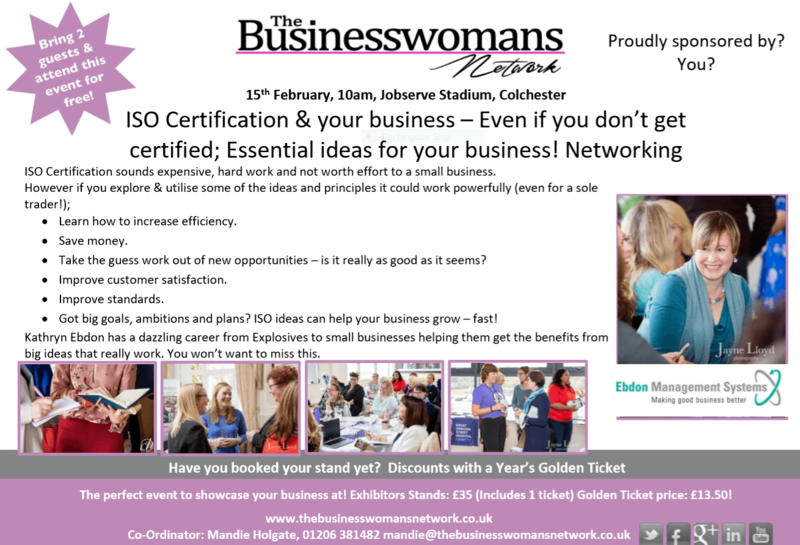 Plenty of time to free network and talk about your business too! Do you lack creativity to write blogs? Do you write blog articles and discover no one ever reads them? Do you write content and think it's doing nothing for you? This masterclass could change the results you get when blogging for business! Key elements to success, How to format your blogs, The power of the right images, how to share your blogs so people connect, love your business and buy! Therapia, talk images with exhibitor Jayne Lloyd and meet lots of like minded business owners! 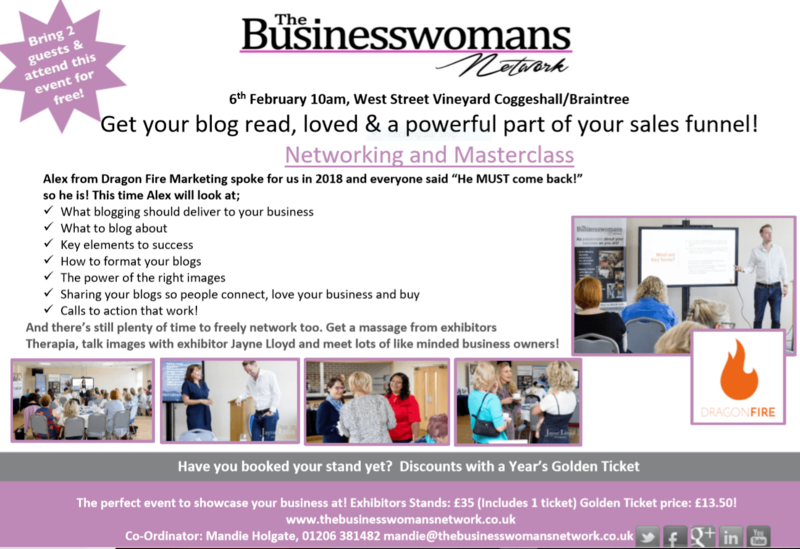 Sponsor this event for £100 and get a 10 minute spot light slot, your business literature on every place setting, online and offline promotion up to the event AND 1 ticket and 1 exhibitors stand! What damages your ability to connect, build rapport & ensure sales? How can you ensure you're connecting powerfully with your target audiences? What damages your brand and ability to make the sales? Learn the branding errors that businesses make and how to avoid them. Learn how to create a powerful brand. Branding is the power to help you find your audiences and make the sales. To find your audiences you need to showcase your values, ethos and why your products and services are right for those audiences. How can you ensure you do this easily? Learn the principles of branding that you can apply to your company to create a strong brand and the impact it can have. 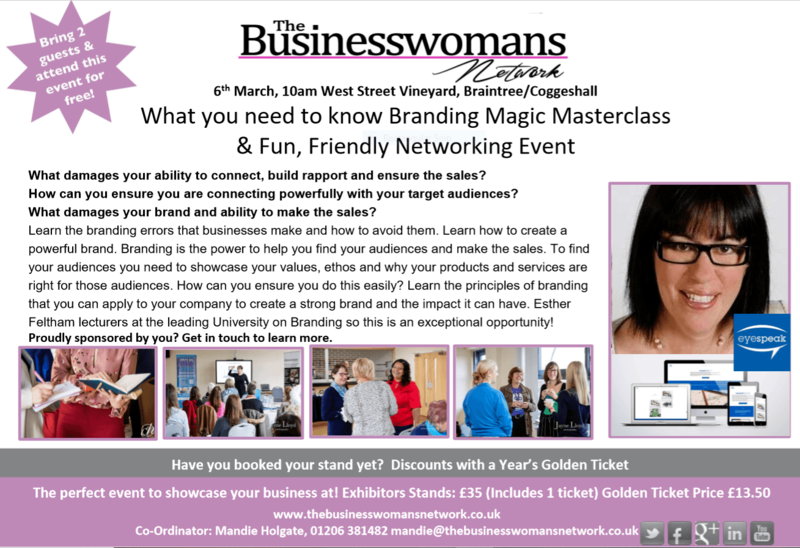 Esther Feltham lecturers at the leading University on Branding so this is an exceptional opportunity! ​Can your business really get to page 1 of Google? The strategy that gained 1 business £2000 worth of sales in 2 days! Why you need to change what you do to get your website seen. How AI relates to what you should be sharing and rewards those displaying what it sees as “naturally occurring patterns”, with a better ranking, leading to more sales. What SEO really is, without the technical jargon and how it relates to your business success. Learn the top strategies the Fortune 500 companies use that apply to your business too! 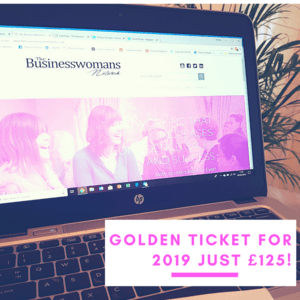 Louisa Goldstone Smith has created multiple award-winning companies and knows how to get a company seen and loved online, with clients around the world across all sectors – this is not to be missed! Connecting the dots is a method that got 1 business 50,000 visitors in just 48 hours and another £2000 worth of business in 2 days! ISO Certification sounds expensive, hard work and not worth effort to a small business. Learn how to increase efficiency. Take the guess work out of new opportunities – is it really as good as it seems? Got big goals, ambitions and plans? ISO ideas can help your business grow – fast! Kathryn Ebdon has a dazzling career from Explosives to small businesses helping them get the benefits from big ideas that really work. You won’t want to miss this. Founder of The Business Womans Network Mandie Holgate still hosts our North and West Essex events as well as being a Business Coach to busy Business Owners and hosting privately funded training programmes for businesses in areas of Confidence, Achieving your goals, Creativity, Marketing & Sales, Business Growth, Public Speaking, Focus, Accountability, Leadership, Networking, Reputation, Business Communication,Time Management, Motivation & Fear of the Phone. 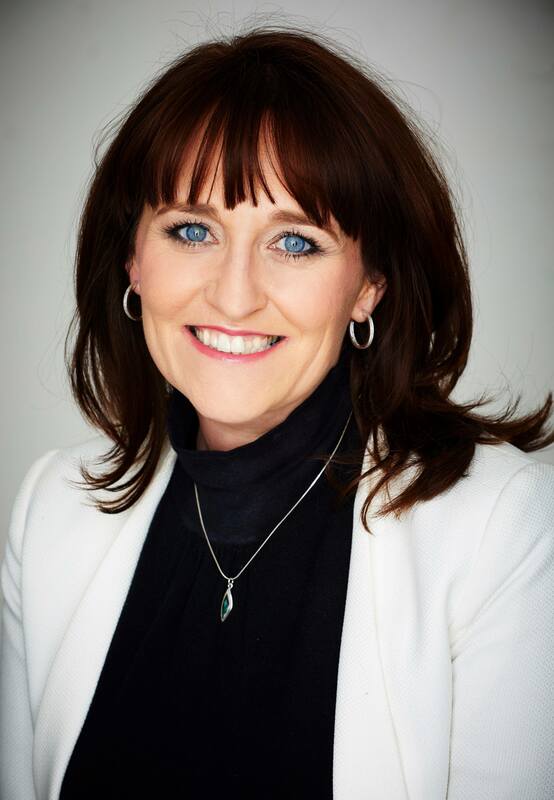 Mandie is also a powerful professional speaker who really gets her audiences thinking and changing their actions having spoken for national conferences and is often in the media speaking about business success as well as areas such as work life balance and serious illness and successful business. Mandie’s 3 books can be ordered now on Amazon and you can join Mandie on The Insiders where you can ask any question to help increase your success. To learn more about our Founder say “Hi” on her social media all accessible via her website mandieholgate.co.uk Mandie also has courses aimed at busy business owners from just £7 (everything she does it aimed at helping you make sacks of cash, not spend it!) And you can get a discount on these too as an Insider.